In this post, I’ll explain how to login to windows 8 using built in administrator account. In windows, administrator account access is required to access important files and folders. Also this account allows users to make changes in registry, group policies and other system files. See the rest of the post to find out how you can enable the built in administrator account. In Windows 8, the built in administrator account is disabled by default. So you will require to enable it first before using that account. Here’s how to do it. It will ask for UAC, click yes to continue. Now Computer Management console will open up. Click System tools folder and from there select Local users and Groups. Next, click on Users folder. Now if you see the right pane of the computer management window, you can see the list of accounts created on your computer. From there you’ll be able to see the administrator account. 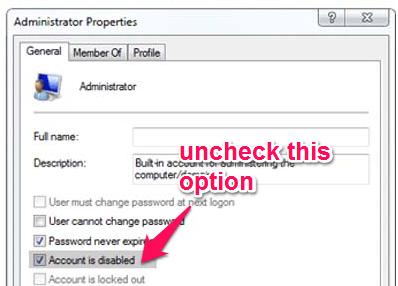 Now right click on the administrator account and select properties. In the properties tab, uncheck the option “Account is disabled”. Click Ok and close the computer management window. With these steps the administrator account is active in your computer. Create a very strong password for this account so that this account is not misused by any other users of your computer. Login to Windows 8 using this administrator account and do the changes which are required. Disable this account if you’re not planning to use it in near future.